Lior Paritzky from Laowaiblog and Mr. Bill Russo, China auto industry expert, discuss recent trends in China's auto industry market. In times of financial uncertainty, how do foreign car manufacturers, which have become accustomed to China being the biggest auto market in the world, cope with slowing economic growth? 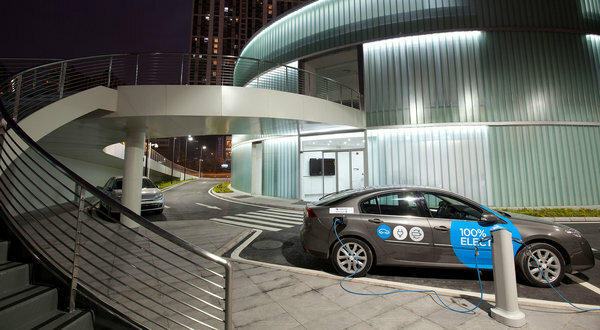 Has the potential of the Chinese auto market been fully appreciated? And what type of cars can we expect to see on China's roads in the next few years? During the Frankfurt auto show in September Martin Winterkorn was seen circling Hyundai’s new i30 hatchback, probing every inch of the South Korean car’s fittings with a tape measure and miniature flashlight. With a retinue of anxious underlings in tow, Volkswagen’s chief executive tested the release of the car’s steering-wheel. When it changed position soundlessly something seemed to snap in VW’s chief executive. “There’s nothing rattling,” he barked at his chief designer. “We can’t do it, BMW can’t do it – why can they do it?” The moment was captured on camera and soon became a viral hit on YouTube. The incident underscored both VW’s obsessive attention to high-quality engineering and the carmaker’s acute awareness of the threat posed by its main competitors. Industry consultants will this year crown VW as the world’s biggest carmaker, but the German company must fight hard to fend off Toyota, General Motors and Hyundai in order to keep the title in the years ahead. The battle for the number one spot may well be decided in the world’s two largest car markets: China and the United States. For VW, however, these countries represent markedly different challenges. VW was a pioneer among western carmakers in building local production capacity in China and is now the market leader there. In contrast, VW has struggled in the US with quality, pricing and brand-positioning issues, and has for years trailed rivals and lost money. To turn this round, it needs to convince Americans that it its cars offer the same value for money as those offered by the market leaders, GM, Ford Motor and Toyota. VW, which in the past confused American carbuyers who were unsure whether it was a premium or a mass-market brand, is pinning its hopes on a modified version of its Passat saloon. Whereas the prior generation Passat was priced higher than most of its competitors and covered only 8 per cent of the midsize segment, the new model made in Chattanooga comes with a variety of trim levels, engine packages and prices that cover 80 per cent of the midsize car segment, VW says. The carmaker’s renewed assault on the US has been backed up by a canny marketing push. Last year VW presented 275 audience members of the Oprah Winfrey show with a yet-to-be-built new Beetle. During this year’s Super Bowl, VW debuted a well-received advert starring a child in a Darth Vader outfit attempting to harness “the force”. Its efforts may be starting to pay off. Volkswagen’s US sales were up 23 per cent to almost 400,000 units in the first 11 months of the year. However, Mr Browning must maintain this momentum if VW is to achieve a company target of at least 800,000 US car sales by 2018 and fulfil VW’s goal of returning to profitability in the US by 2013. The challenges that VW faces in China are of a very different order: holding on to the top spot as the country’s largest foreign car brand. After entering the Chinese market before its major rivals in 1984, VW has consolidated its position through its successful, highly profitable joint ventures with domestic carmakers SAIC and FAW. VW has over time moved from selling stripped-down, basic cars such as the Santana, the workhorse of Shanghai’s taxi fleet, to sophisticated models designed expressly with Chinese tastes in mind, such as the VW Lavida and the long wheelbase Audi A6. VW delivered 2.1m vehicles to Chinese customers in the first 11 months of the year, an increase of 15.5 per cent on the same period a year earlier, cementing China’s position as VW’s largest market. Many believe Karl-Thomas Neumann, head of VW’s China operations, could succeed Mr Winterkorn as group chief executive, if he succeeds. Still, VW lacks a model to compete in the increasingly important ultra-low cost segment in emerging markets such as China and India. Although such cars tend not be to very profitable, they are set to become a significant source of industry volume growth in the coming years. VW’s forged an alliance with Suzuki in 2009 that it hoped would give it access to the Japanese’s small-car expertise. But these plans were left in disarray after Suzuki requested dissolution of the tie-up following huge cultural differences. 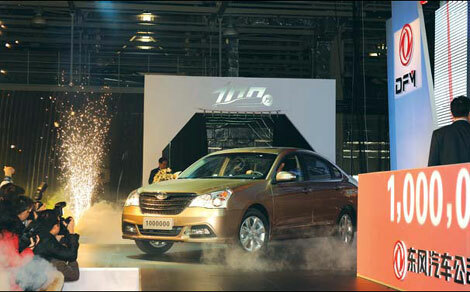 The carmaker is now said to working on a stripped down version of its new small car, the Up!. “VW needs to develop a really cheap car if it wants to maintain a dominant role in the global car industry,” says professor Ferdinand Dudenhöffer at the centre for automotive research at the university of Duisburg-Essen. NEW YORK - While American politicians have lashed out against China's new two-year tariff on imported cars from the United States, business analysts don't expect them to have that much of an effect on the industry. China's Commerce Ministry said on Wednesday duties between 2-21.5 percent would be imposed starting on Thursday on large cars and SUVs with 2.5-liter engines and above. Chinese authorities, citing that US imports were "damaging the local car industry", listed the following companies required to pay the tariff: General Motors Co, Chrysler Group Ltd, Mercedes-Benz US International Inc, BMW's factory in Spartberanburg, South Carolina, and Honda of America Manufacturing Co. The ministry noted that GM and Chrysler were bailed out by the US government in 2009 and the others have received local government tax credits and other subsidies to support production in the US. Growth of car sales in the world's largest automobile market has hit a 13-year low, hurting Chinese producers more than foreign automakers. For some analysts, this appears to be a "retaliatory measure" by China in response to the World Trade Organization rejecting its appeal of a ruling in favor of US duties on imported Chinese tires. This action, which "reflects the rising tensions between China and the US on trade matters", will have only a small impact on the industry, said Bill Russo, founder and president of Synergistics Ltd, an international advisory firm. "The impact on GM is very limited. 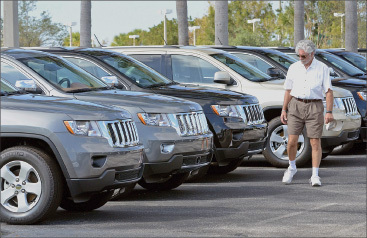 GM imports less than one-half of 1 percent of its Chinese volume, and the imported vehicles in GM's lineup, such as the Cadillac SRX and Buick Enclave, are sold to customers who are less sensitive to prices," Russo said. JP Morgan analyst Himanshu Patel agrees that China's tariff - 8.9 percent anti-dumping duty and 12.9 percent anti-subsidy duty - won't hurt GM's profits in China much. Patel, in a research report to address China's import tariffs, cited that GM sold fewer than 32,000 imported vehicles in China, compared to its total of 2.4 million car sales in China. 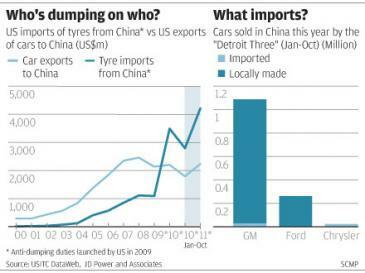 Ford imports just one model to China and is not likely to be affected. Chrysler, on the other hand, is completely reliant on imports. Chrysler plans to localize production through its majority shareholder Fiat SpA's partnership with Guangzhou Automobile Group, according to Russo. To account for the new tariff, carmakers will either pass on the higher price tag to consumers or absorb the added cost, which will impact their profit, said Russo. But in the long term, they need to "shift to a localized business model to mitigate such trade risks" he said. 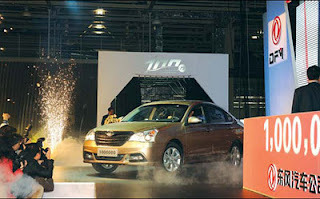 Patel projects China's tariff will motivate GM to produce cars in China. Klaus-Peter Martin, GM spokesman, told Bloomberg in an interview that the company's goal is to build where it sells. German carmaker BMW leads the pack in "material exposure" to the tariff, with about 25,000 vehicles imported from the US, Itay Michaeli, a New York-based analyst for Citigroup Inc, wrote in a note to clients. Washington-based US-China Business Council (USCBC), said in a statement that motor vehicles affected by the tariff represents about 3 percent of all American exports to China. In 2010, the US exported about $3.5 billion worth of motor vehicles to China and this amount is projected to increase to almost $4.5 billion this year. "The ability for American companies to export and sell cars to China is important," USCBC President John Frisbie said in a statement.